"Get most of what I want done, most of the time." "Stupid Simple and Highly Engaging"
The ease of use for both administrators and end users. Having it be a builder aligns with the websites we build, which are all built using builders. If we can make the process easy on our users (administrators and web management), make it more engaging for their end users (audience), then everyone wins; from WPForms to our own agency. Nothing really. The plugins is legit. Maybe make conditionals a little easier. But the plugin is robust enough for our audience and not overly complicated like so many other plugins out there in the forms space. The hardest aspect of forms is getting end users to complete lengthly forms. WPForms makes it easy admin side (we know that), but Conversational Forms makes it easy for our end users. The ability to easily add payment components is key for things like signups and registrations, and the opportunity to leverage WPForms for marketing campaigns within our chosen platform is mission critical (ConvertKit). "Great Form Option That Keeps Getting Better"
That they are continuing to grow this plugin. They add new features and listen to what the users are requesting. And the support is top-notch! Limitations. Good bit of issues get answered with "Thanks! That is not possible at the moment, but It's a great suggestion and has been on our radar for possible future updates". Or something along those lines. Then we play the waiting game to see if they actually pull the trigger. If looking for a simple solution to easily implement forms into your site automatically pulling CSS to match the look and feel, this is the plugin for you. Very short learning curve! Drag and drop format makes building a complex form a breeze. Majority of the functions you need out of a form builder are included out of the box (conditional logic, payment options, control over layout and style, etc). Their premade templates make creating a new form much easier and faster as they have a significant amount of forms to choose from. Just choose the form and edit it to your needs. If you need it to work with WooCommerce, you are in luck! We have developed a 3rd party plugin that will allow you to use WPForms with WooCommerce, which was the biggest oversight, in our opinion. I implement beautiful and effective forms for many different needs easily and efficiently using this plugin. "Amazingly easy-to-use and extensive Form plug-in"
It's so easy to create a professional looking form in a matter of seconds with all the options you could want from a form plug-in. The integrations with e-mail marketing platforms and payment providers are also incredibly helpful. The drag and drop editor works perfect and has plenty of options with showing labels and/or sub labels to create a great form. I also used their extension which allows you to use logical operations to determine which fields to show, such as when a checkmark is submitted or not. This has proved invaluable to some of my clients. Allowing me to build forms like this form my clients has helped tremendously in cutting down development time on things as simple as a form. I would like WPForms to create a widget in the Wordpress customizer to adjust font colors / sizes etc. so that my clients are able to change the look and feel of the forms in the same way as they change other aspects of their websites. This is by far the best forms plug-in I have seen for Wordpress websites. I suggest you try the free version out if you're skeptical and see if it's the right fit for your business / clients. It's tough to make websites for clients where you can leave them in control of anything that might break, such as forms. I have WPForms running on about ~20 client websites and I've only ever had 1 problem with the plug-in. I submitted a customer support ticket, got a reply within the first hour and the bug was fixed and released later the same week. I really feel like I can (and I do) use this plug-on on any website for every type of form. "Do Bear's Submit forms in the WWWoods?" 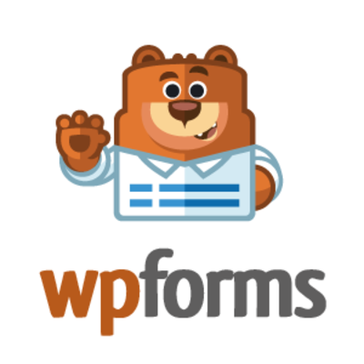 That Bear logo is really cool, but on the serious side, WPForms is reliable, easy to use, and super flexible. I'd grown tired of receiving Spam from other Form Plugins on my own websites, and my Agency clients are happier with WPForms Spam prevention features too. I'm a Yorkshire lad, so you guessed it, the part I don't like is the price. WPForms is great but it would be less painful if the renewal costs could be reduced down a bit more after the initial buy-in. When you are stepping up the quality ladder integrating WPForms with WP Mail SMTP plugin will enhance deliverability of Web form messages especially in conjunction with the likes of Mailgun. The rapid rollout of typical website forms. Easy to tweak layouts, language and form flow with the drag and drop builder. The familiarity with the plugin at scale saves us time and inspires confidence in front of clients with more complex form requirements. "Easy to use with powerful options"
The interface for WPForms makes it easy to navigate and create new forms with complex functions. There are short codes you can use to allow more than one field per row, but you have to Google to find the short codes. It would be nice if you could check a box or find this info directly inside the form creator. It's easy to give it a try since you can start using it for free. There are a number of great add-ons and integrations available, too. I've activated several of the add-ons and have set many up for clients. But one of the most important features of WPForms is the customer support. Good support cannot be under-rated, and WPForms support is top notch. It's great to have the ability for lead capture, surveys and polls, online payments, event registrations, etc. all in one handy place. "I am just glad I grandfathefed it"
I glad I grandfathered this plugin back in Januari 2017. So I get lifetime subscription for its highest plan. What I like the most is I can create simple forms easily in seconds. If I want to create a long form, I can divide the form with its page break. And I also like the integration with zapier. I don't really have anything that I dislike about this plugin. But if there is a feature to make a quiz with wpforms, that would make it the best form plugin out there. Creating wordpress forms easily. I can create almost any kind of forms, except a form to make a quiz. But it has been developed continuously, I hope this feature will be available in the future. "Simple user interface and easy to use"
Wpforms is easy to use by just drag and drop plugin. It makes contact form fast and simple. Its drag and drop system makes it easy and fast. Page creation in wordpress sites now becomes more simple and easiest. Its user interface is very simple and easy. This plugin is very easy to use but if you use free version then you will get limited functionalities but if you will buy premium it will be very useful. If you are starter then its free version of Wpforms is very useful for you. You must try it once to see its features. I am using this plugin for my websites and it has helped me to improve my website and increase page functionalities. "User Friendly - Zapier Automation"
I love how easy it is to create a form. I also love how I can integrate the form with zapier. This allows me to capture information from the forms to input into other applications that I am using. I am 5 forms deep and creating my 6th form but I'm lost on how to put it together. I was looking for a way to create a quiz and/or assessment like form and having trouble with it. I'm hoping by asking the community I will get a response. I run a cloud based accounting practice so WPForms has made it so easy to create intake forms and questionnaire that I can get my clients to fill out online. "The most practical way to make forms! " This program is a very useful tool and the best of all is that it is very easy to use when you need to make forms in a blog, the amount of tools you have are very easy to use and conbsigues everything you want according to your needs, It is a very friendly program. This program has so many but so many options and menus that it is almost impossible to know them all, however it is a very useful and versatile program, saying something specific that I do not like for me is very difficult, I would only recommend unifying some menu options that are similar, the rest is a great program that can be used to the maximum, as long as you have time and willingness to learn. I'll just say that if you need to collect information of any kind according to the interest of your organization or if you have a particular interest in collecting information about something, you should use this program, since it is very easy to use and you can get it without making large investments of money , just a little patience to get acquainted with the options menu and voila, it is really worth giving you the opportunity to know and use this program. ideal to develop contact forms, suggestions among others, for my organization has been very useful and since this program is very easy to use we have taken much advantage, it is excellent, in this way we have been able to collect important information for us and that It is simply very good for my organization, this program is up to the demands of this globalized world, where the most important thing is to have information. "Easiest and Most flexible form design tool yet"
The flexibility, ease of use, reliability, add-on options, form and function, data collection on the backend, and support - I could on! Nothing noteworthy thus far. But, if there's one thing I'd like to see it would be the customization of data collection fields on the backend. We've implemented it on several different sites for small business owners across a wide variety of vertical and all with individual and unique needs and goals. Each time the form delivered as promised and then some. "Solid software for creating forms on my site"
It is very easy to use, drag and drop and really something that anyone can do quickly. Forms look nice, and do everything I need them to do (including accepting payments). Wish there were more styles and designs that could be used so that I could decide on one that looks best within my site. Not a big problem though. Contact Us forms, event ticket order forms (with payment collection), and more. Fast and easy to create everything that I need. "Great form solution for WordPress websites"
WPForms is a very easy to use with their drag and drop fields. You can customize the field names, what size, how many charters and if it is require for each filed. I love that you can design professional forms with columns. I did use another form plugin at one time, but it wasn't as customizable and professional looking as WPForms. I wish the PRO version didn't cost so much. Other than that WPForms is a great plugin. WPForms is a very easy form plugin. I highly recommend it for beginner and advanced WordPress designers. I own a website design business and build WordPress websites. I use WPForms for most of the forms on my client's websites. There are so many features to use with WPForms. I could create many different forms to gather information and clients find it easy to fill in their information on. Performance of the plugin is top notch and loads quickly backend and frontend. It is hard to customize CSS and make it look less basic. I highly recommend WPForms Pro. You receive the whole package. I love the simplicity of placing the functions. Highly recommend the signature feature and being able to receive payments while also getting them to sign up to your newsletter. WPForms was the solution to everything, from business contracts, receiving payments without having to do phone calls and having people signup to our newsletter. "Ease of Use and Works well"
I like the ease of use and the simple layout that my clients who do not have a lot of internet experience can get straight away. Maybe a bit more deep functionality. The design of forms and embedding straight form the form page itself. I have constantly been asked by clients for a form, whether that's a members form, a contact form or other. With WPForms this has been easily remedied, all my clients find it easy to use. "Awesome tool - similiar to Gravity Forms"
I love the drag & drop editor which enables you to create any forms very very fast for almost all web purpose. I am not totally convinced of the front end styling of the basic forms. But it is still okay compared to other solutions out there. Of course it would be nice to also have all add ons free available in one bundle purchase. but this is not the case though. I would love to have a one time instead a yearly fee - like a unlimited lifetime license. Maybe this will be in the future. Maybe you can have a look at gravity forms. We have been switiching to them recently. Our clients demand professional web forms that help their customers sign up for events, contact for business inquiries or just communicate with tons of customers on a daily basis. We are in charge of implementing that for them. So we used to utilize WP Forms because it's super fast and easy to edit even for non technical staff members. I installed this on a website recently simply for the fact that it integrates with Constant Contact, has honeypot and recaptcha integration as well. I was able to get it up and running almost right away, right out of the box. If desired, you can customize the CSS so the form is to your liking. Very basic and limited as far as design. Even when editing the CSS directly, the form wasn't responding as I had hoped. Like I said, the styling is extremely limited. Able to keep bots from subscribing via sign up forms with a double layer of security: honeypot and recaptcha. "Clearly the best Forms for WordPress"
I'd appreciate a more fluid way to go from the form creator to a page or post to embed. Maybe even a way to attach the form to a page from the builder (probably just a specific use case request here)? Don't wait, it's the right decision. 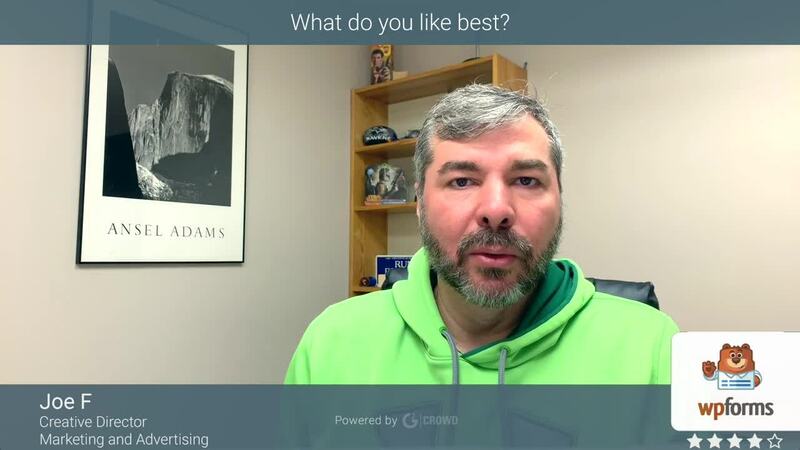 Onboarding, contact, registration, polls and surveys. It's quick and looks nice, always playing well with the different themes. The form was easy to add to my wordpress site and it was free which made it a good idea to try and see if it works for my needs. So far, I haven't had any issues with it but I can see how the customization might be lacking if I need to change anything with it. The lack of customization features may be a concern in the future when I would want to change the form to be more specific to what i need. Make sure you know what you are getting when you install this plug in. There are many to choose from so do your research. Looking to have visitors provide feedback and a way to contact me in a convenient way. It also keeps my email address private. "WPForms Is A Lean & Fast Form Making Machine"
WPForms allows me to quickly & easily create forms that DO NOT slow my site speed. The Pro version captcha can be a little difficult for people that lack math skills and cannot locate their computers calculator. I love the conditional features that really make WPForms and advanced option wihc my clients love. I love everything, if there was one thing I would say easier options for styling. They do have custom css sections and options in settings. But I want more styling options. This is the only forms plugin you need. I use WPForms for everything from volunteer forms, to donation forms with payment! as well as user registration and post-submission! "Easiest forms plugin to use"
The drag and drop interface and the fact that it is highly configurable to the users requirements. Forget the rest. This is the easier and most comprehensive forms plugi for Wordpress ever. I use WPForms on all my websites. It's easy to make great looking contact forms. I used to be confused how to make it send to the correct email. When people want to contact myself or my customers I put in WPForms in my wordpress sites to easily have a contact form. Its nice add on for wordpress and it allows me to edit and modify pages easily. its simplicity design makes it effective and user friendly. Drag and drop feature makes its fast and easy for anyone. free version has its limitation as compared to premium ones. It allowed me to easily manager my website for product reviews. Best software for form builder in wordpress , it's drag drop functionality is very effective to build website forms. We cannot customize it to our own way , we must stick with their own validation or theme. By using WPForms we develop a fast and Efficient way to develop our website. "Not Terrible, But not the best WP Form Plugin"
Collect and gather data of users visiting websites. I really like the drag and drop feature that makes the overall process so much faster and easier. I did not like that we need a plugin in order to use this. * We monitor all WPForms reviews to prevent fraudulent reviews and keep review quality high. We do not post reviews by company employees or direct competitors. Validated reviews require the user to submit a screenshot of the product containing their user ID, in order to verify a user is an actual user of the product. Hi there! Are you looking to implement a solution like WPForms?